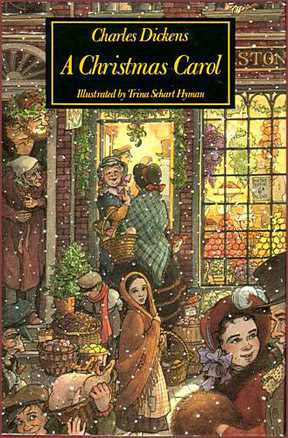 Dickens’s keen ability to write a character like Scrooge, one that will live on in the hearts and minds of people for generations to come, is simply marvelous. And yet, the brilliance of it is the idea of redemption: Can we turn ourselves around and start over, change our ways, and become better people? Therein lies the appeal. Show me a person who hasn’t done something in his or her life that he or she regrets, and I’ll show you a ten-legged alien from the planet Out-in-space. We fail. We do dumb things. We make mistakes. Scrooge’s mistakes were just on a grand scale. Yet he repents, changes, and comes to terms with it. He rights his wrongs. One may question the novel’s incredible, yet simple, theme and whether or not these things were imagined or real. Did the ghosts actually appear for his salvation? Or, did Scrooge imagine them or dream them in order to save himself? It really doesn’t matter either way, but I can ask you one thing: How many of us would want to “revist” our pasts with the Ghosts of Christmas Past and Present and “see” the things we’ve said or done that may have been hurtful or have to examine again the choices that we’ve made in life? Luckily for us, it’s Dickens’s brainchild, so we don’t have to endure that. We can live vicariously through Scrooge. He had to endure it, for all of our sakes. And it all started with an old miser named Ebenezer Scrooge. Ah, yes, my favorite Christmas story. I have two favorite versions: Alastair Sim as Scrooge in the 1951 film and Michael Caine in The Muppets Christmas Carol. You can really see them change throughout the film. One admission though – I have several more Scrooges in my collection. Try Henry Winkler, Patrick Stewart, George C Scott, and a few others. And that doesn’t even include ones where Scrooge is female! It would have been more interesting if he had of been visited by Bob Marley’s ghost instead of Jacob Marleys!